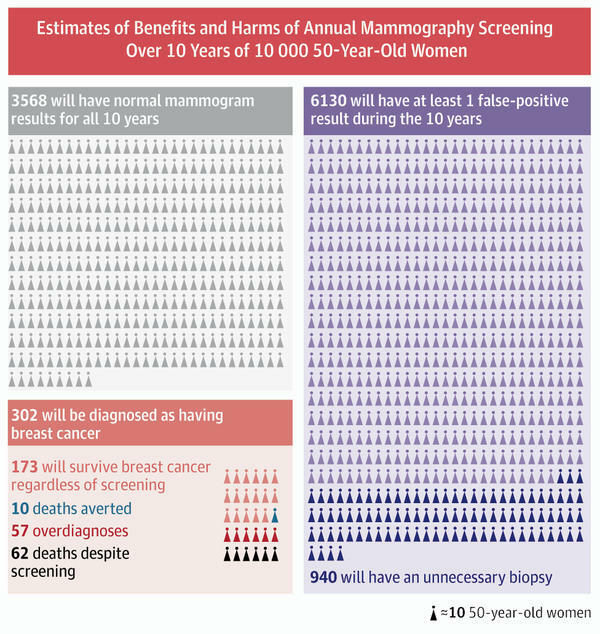 This graphic lays out the possible outcomes for 10,000 women if they start getting annual screening mammograms at age 50 and continue that for 10 years. Women and their doctors have a hard time figuring out the pluses and minuses of screening mammograms for breast cancer. It doesn't help that there's been fierce dissent over the benefits of screening mammography for women under 50 and for older women. To make it easier to grasp the big picture, Dr. Jill Jin, an associate editor of JAMA, the journal of the American Medical Association, put together this graphic on the odds of various outcomes from screening mammography. It's based on a review of studies on the risks and benefits of mammography earlier this year and was published Wednesday in JAMA. Because mammograms aren't perfect screening tests, they can miss some cancers and falsely diagnose cancer that's not there. Those false positives can lead to more testing, including biopsies, and needless anxiety. Mammograms can also lead to overdiagnosis, when a scan finds something that would never become life-threatening but can lead to surgery, radiation and chemotherapy. Some studies estimate that 20 percent of cancers found on mammograms are overdiagnosed and lead to unnecessary treatment, according to Jin. The graphic looks at the odds of false positives, overdiagnoses and breast cancer diagnosis for 10,000 women over 10 years, if each started getting annual mammograms at age 50, the age recommended by the U.S. Preventive Services Task Force. About 3,568 women will have normal exams, while 6,130 will have at least one false positive result. About 302 will be diagnosed with cancer, and 10 deaths will be averted because of screening. Bottom line: Mammograms are the best tool we have for early detection of breast cancer, but they're not perfect. It's best to know the likelihood of possible harms, as well as the benefits.